Battle theme - Monstrous Monstro -Arena Ver. Prankster's Paradise is a Sleeping World that is featured in Kingdom Hearts 3D: Dream Drop Distance, although a simulation appears in the Mirage Arena in Kingdom Hearts Birth by Sleep Final Mix. It is based on the Disney film, Pinocchio, as was Monstro. A world based on Pinocchio was originally intended to appear in Kingdom Hearts 358/2 Days, but was removed due to time constraints. Tetsuya Nomura explained that the planned plot for the world was set in a circus and playing off the story of Pinocchio, a puppet with a heart, and the Nobodies who possess no heart, then planned for a sad episode with Roxas and Xion looking for hope for themselves. The world would have included a human Pinocchio, Geppetto, and the villains Honest John and Gideon from the original film. The profile sprites for the characters still appear within the final game's data. The Rough House is seen in an early render of the Amusement Park, but was removed in the final game. The positions of the carousel and several tents were also changed. Most of Prankster's Paradise setting takes place on Pleasure Island, the beginning area, the Amusement Park (遊園地, Yuenchi?) is a large theme park with a few towers, a Ferris wheel and a carousel. A roller-coaster track is also present, encompassing the entire area. A path leads to the Windup Way (からくりトンネル, Karakuri Tonneru?, lit. "Gizmo Tunnel"), a long path that features some displays from the circus, including dancing marionettes and the large face of a clown whose eyes follow Sora. There is also a large room with another carousel with various animals, a rippling path and finally a large room leading to the Circus (サーカス, Sākasu?). This area is a round room with bleachers and three trampolines in the middle with some trapeze swings hanging from the ceiling. Another path beyond the circus is the Promontory (岬, Misaki? ), that is a short path viewing and leading into the ocean, along this path there is a closed-in area with steps and water puddles. Beyond this is the Ocean Floor (海中の道, Kaichū no Michi?, lit. "Undersea Road"), a large sandy area under the sea with rocks stacking on top of each other and whirlpools that lead to other areas. The final area is the Ocean Depths (海の底, Umi no Soko?, lit. "Seafloor"), leading to a dark and gloomy section of the ocean that only leads to the area where Sora battles the Chill Clawbster. The minority of Prankster's Paradise is set inside Monstro the Whale, where many of the areas are Monstro's digestive system. In Kingdom Hearts: Birth by Sleep Final Mix, the battle against Monstro is set in a large oceanic area with a number of shipwrecks and rafts known as the Star Ocean. A digital copy of Prankster's Paradise is used as the battlefield of the "Monster of the Sea" battle at the Mirage Arena, in which Terra, Aqua, and Ventus battle against and within Monstro. Prankster's Paradise was destroyed by the Heartless. During the chaos of the destruction of their world, Geppetto, Pinocchio, and Jiminy Cricket were separated, each landing in a different world; Geppetto was swallowed by Monstro, Pinocchio washed up in Traverse Town, and Jiminy Cricket wound up at Disney Castle. Though it was restored after Sora defeated Ansem and destroyed the End of the World with Pinocchio and Geppetto returned to that world, Prankster's Paradise remained in a deep sleep instead of returning to the Realm of Light, plagued by Nightmare Dream Eaters. Sora first arrives in the Amusement Park and he marvels at it until he notices Jiminy Cricket, musing to himself about the missing Pinocchio. Sora approaches him, but Jiminy does not recognize Sora, and Sora realizes that this Jiminy is part of the world's dream. Jiminy explains Pleasure Island to Sora, then remembers that Pinocchio had been told by a man in a black coat to play a trick on Sora. Sora agrees to help Jiminy look for Pinocchio and they search the park, encountering several Dream Eaters disguised as the puppet. Jiminy gets discouraged, but Sora spots Pinocchio entering Windup Way, and they follow after him, finally catching up to him in the Circus. Sora rescues him from Dream Eaters, and he and Jiminy escapes while Sora defeats the Nightmares. After clearing the area, Sora is suddenly confronted by the unknown man and Xemnas, to Sora's confusion. Xemnas mocks Sora, remarking on Pinocchio having grown a heart and comparing Sora to a Nobody before disappearing again with the other figure. He continues on to the Promontory, where he is met by the Blue Fairy, who tells him that Geppetto has been swallowed by Monstro and that Pinocchio and Jiminy have followed after him. Sora follows them underwater, and finds them in time to see Monstro swallow them. He tries to swim after them, but he is overtaken by the Chill Clawbster, which freezes Monstro solid. 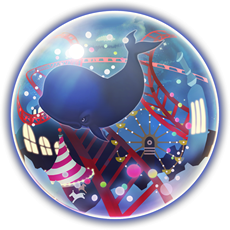 Sora battles the Dream Eater atop the ice, and in the course of the battle, he frees Monstro, encasing him in a bubble. When they catch up to the Chill Clawbster, Monstro escapes the bubble and swallows the Nightmare, blowing Sora away in the process. Sora wakes up on a beach, where he contemplates the events that lead to the world being swallowed by darkness and Pinocchio, Jiminy, and Monstro being cast into the sea between worlds. The Keyhole appears over the water, and Sora unlocks it. In the meantime, Riku arrives in the mouth of Monstro, where he finds Geppetto calling for Pinocchio. Riku offers to help search, and Jiminy tells him Pinocchio left with someone in a black coat. Jiminy accompanies Riku as he explores the inside Monstro, and they eventually find him and the black-coated figure. The figure prompts Pinocchio to return to Riku and Jiminy, then, when Riku demands to know who he is, he removes his hood to reveal Riku's own face before leaving through a corridor of darkness. Riku tells Jiminy and Pinocchio about his dark past, and Pinocchio and Jiminy ask if Riku has a friend who can show him the right path, reminding him of Sora. They hear a roar in the distance, and Riku sends Jiminy and Pinocchio back while he continues on to face the Char Clawbster, which he defeats. As Geppetto and Pinocchio are reunited, Riku recalls Yen Sid's words on the dreaming worlds, and he unlocks the world's Keyhole. Honest John and Gideon are mentioned by Pinocchio as two big monsters with big green eyes, but they have not physically appeared. In the original 1940 movie, the curse of Pleasure Island transforms boys who "make jackasses of themselves" into donkeys. In Kingdom Hearts 3D: Dream Drop Distance, "jackasses" has been replaced with "jackamules" to keep the game at a lower rating. One of the signs in front of the Circus bears the words "Daring Journey" in reference to the ride "Pinocchio's Daring Journey" from the Disney Parks. The sign above the entrance to the Amusement Park reads "Paradise Island," even though the location itself is named "Pleasure Island" in the original film.